Os grid reference: ST4380 9352. On the southern ridge of Gray Hill* (Mynydd Llwyd) 260 metres (854 feet) above sea-level and overlooking Penhein, Shirenewton, Caerwent and the Bristol Channel, in southern Monmouthshire, stands Gray Hill Stone Circle, a Bronze Age monument said by some historians to be older than Stonehenge! This ancient monument is best reached from Wentwood reservoir, then by ‘climbing up’ the hill and along the eastern ridge, and then dropping down the south-side of the hill to where there are some ancient quarry workings and, just below stands the circle of stones, quite a few of which now lie recumbant. 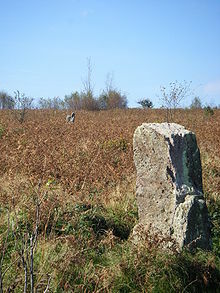 There is another single standing stone over on the north-west side of the hill and another stone to the east on Mynydd Alltir-Fach (also known as Money Turvey Hill) which is aligned with Gray Hill Stone Circle. Llanfair Discoed is 1 mile to the south of the hill, Penhein is 2 miles to the south and the Roman town of Caerwent is 2 miles south-east. Caldicot is about 3 miles to the south-east. [*Gray Hill can also be spelt as ‘Grey Hill’]. There are at least 13 stones ranging in height/length between 1.5 and 2.3 metres in a resonably well-defined (albeit broken) circle that is 32 feet (9.8 metres) in diameter, but there are also a few outliers; the stones are ‘said’ to have come from the quarries back up the hill. The circle is broken, miss-shapen at the west and east sides, the stones from these sides having been robbed-away in the mid 19th century. Only two of the thirteen stones are now standing, these are at the north and north-east of the circle, while a third stone has fallen over; one outer stone is still up-right, while another is recumbant. The outer up-right stone may well line-up with the Midwinter sunrise; the north-east stone and the fallen inner stone could also line-up with the Midwinter sunset. The two standing menhirs, which may be part of the cove, are rather jagged and ridged on their tops, one being quite tall, the one other small, but all the stones here are very sturdy and very substantial. It would have been quite a sight when they were all standing in the circle. A sort of ‘processional way’ to the second (outer) standing stone and barrow cemetary are evident at the east side of the circle, according to authors George Children & George Nash in their work ‘Prehistoric Sites of Monmouthshire’ 1996. Aubrey Burl described the monument as a cairn circle in 1977. So, with that in mind it’s plausable to say that there may have been a burial in the centre of the circle. Children, George & Nash, George., Prehistoric Sites of Monmouthshire, Logaston Press, Almeley, Herefordshire, 1996. Hando, Fred., Hando’s Gwent, ed. Chris Barber, Blorenge Books, Abergavenny, Monmouthshire, 1987. Barber, Chris., Mysterious Wales, Paladin, London W1X, 1987. Palmer, Roy., The Folklore of (Old) Monmouthshire, Logaston Press, Almeley, Herefordshire, 1998. Barber, Chris & Williams, John Godfrey., Ancient Stones of Wales, Blorenge Books, Abergavenny, 1989. 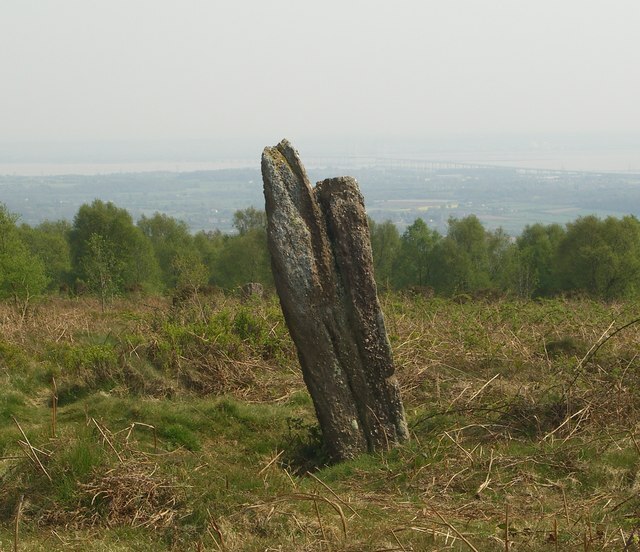 Categories: Standing Stones, Stone Circle | Tags: Gray Hill Stone Circle at Llanfair Discoed in Monmouthshire | Permalink.